You might have noticed I've been mildly obsessed with all things hands and nails lately. It's not easy, considering that I'm prone to extreme dryness, plus I'm a klutz and manage to mangle my nails by looking at them. Just this morning I had to take a nail file and shorten them into barely-there length after an incident involving a cup of tea, of all things (don't ask). At least I'm kind to my cuticles. Which brings us to a couple of hand products that I've had around for months or years. I'm always applying creams, lotions and serums to my hands. Any products sample/GWP item that I'm unwilling to unleash on my face goes to the hand-care box, and I have to tell you that it's a great system that results in very soft hands. But for stashing into my handbags I prefer regular tins and tubes of hand product, mostly for convenience and to avoid errors in judgement. I never bought a single tube of Jurlique Rose Hand Cream, yet there's always a new one appearing here as part of GWP, sampling programs and apparently from space. I'm not fond of the rose scent (Jurlique's is like a watered sown and less sweet version of C&E Rosewater), but once I got over it I've found that the formula, with its high concentration of Safflower seed, almond and macadamia oils is an excellent warrior in the fight against dry hands. The fragrance doesn't linger, but the softness does, making me a convert. Bottom Line: I might eventually buy the full size tube. Burt's Bees cream sinks in instantly and makes a bad situation more tolerable. There's no greasiness left and the lemon scent is pleasant. I can't say that it has a lingering effect or that it does more than feed thirsty skin on the spot, but sometimes that's all that matters. I use this Burt's Bees as a quick fix after removing nail polish or exposing my hands to harsh detergents. Jurlique Rose Hand Cream ($25, 1.4 oz) is available from BeautyHabit and Dermstore. Burt's Bees Lemon Butter Cuticle Creme ($5.99) can be found at Whole Foods, many drugstores as well as from drugstore.com. 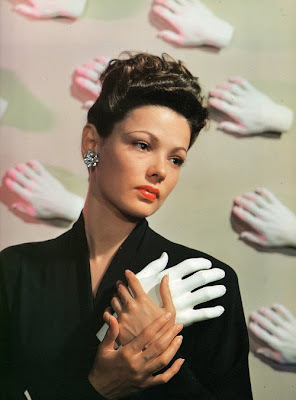 Creepy photo of Gene Tierney from Stirred, Straight Up With A Twist. I agree with you, I'm not a fan of their rose scent either. The lavender hand cream is perfect though. That IS a creepy photo! But she was so very gorgeous, wasn't she? My cuticles are a mess. Time to start taking care of my hands again. This is just ridiculous!